Believe it or not, wallpaper is making a comeback, and we are loving it! There are many new trends out there that are making rooms feel less like big floral bleh and more like a chic design idea. The creativity is in your hands with this trend. Digital print wallpaper lets you have more freedom about which images go on your walls! Any image you can think of can be transformed into a statement piece. You may have seen this trend already, but metallic wallpaper can add elegance and luxuriousness that you've been craving in your home. Our client went with a silver brushed wallpaper for their bathroom below. These 70's geometric trends are making a comeback for sure. An accent wall made of these intriguing patterns isn't overwhelming, but visually appealing. 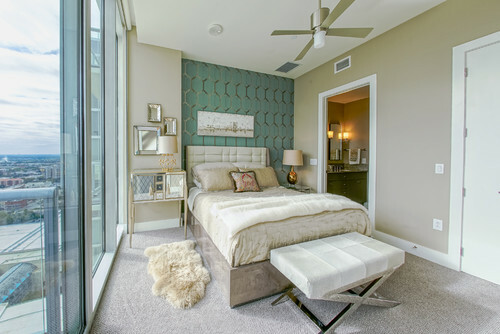 Neutral colors like black or gray can add a subtle and sophisticated feel to bedrooms and living spaces. Meanwhile, brighter hues are perfect for energizing spaces like childrens playrooms. Whatever your style is, wallpaper can be used to successfully capture your personality and design vision simultaneously. Consider giving one of these new trends a try in your own space!